Jade Robinson is a 27-year-old P.E.I. 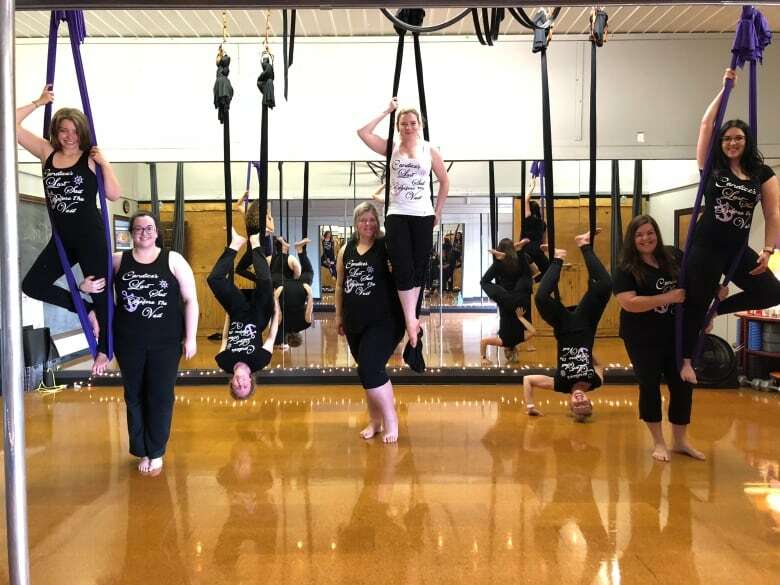 entrepreneur with a successful fitness business — Aerial Warehouse in Charlottetown teaches pole dancing as well as hammock classes. But don't think pole dancing is just for strippers — Robinson says the studio caters mostly to middle-aged women, as well as men and children. "I loved Cirque du Soleil as a kid, so that was a little bit of an inspiration," said Robinson. "Once you experience that feeling of being able to let the thinking go, and let your body move — it's really this nice escape," she explained. "It's absolutely like flying — it's the closest we can get to flying without wings, I think." 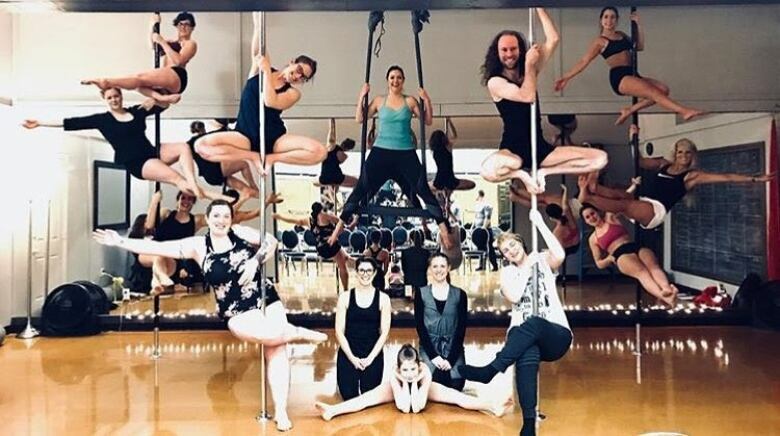 Robinson got the idea to start Aerial Warehouse after taking pole-dancing classes at another studio in Charlottetown, enjoying it so much she became a teacher there. When that studio closed a couple of years ago, she seized the opportunity to open her own studio, the only one in the city. Her other job is working one-on-one with Islanders who have autism or cerebral palsy, helping them communicate. She invested a "substantial" amount of her own money in converting a warehouse space to a studio, featuring floor-to-ceiling mirrors on two walls — one side of the spacious area has seven poles, the other side has seven silky fabric hammocks or aerial slings, similar to the silks used in Cirque du Soleil. Classes are limited to just six students at a time. At first there were some raised eyebrows at the concept when she approached the bank for some help, but she said her proposal including student testimonials and projections won them over. She is making a small profit, she said. "I think any good business owner knows you have to sacrifice, but you also need to be able to pay your bills," Robinson said. Her sacrifice: her time and her energy. She teaches a lot since there is only one instructor, Sarah Roach, and there's pressure for her to stay injury-free. The studio has 50 to 100 students at one time, and about 30 who consistently attend classes weekly, she said. "We have a lot of students from UPEI who are here from other places who may have been exposed to aerial arts before," Robinson said. "But we are slowly growing our Island community, which is really nice." Single classes are $30 for drop-ins, she said, "which seems a little bit steep, but we have such small numbers and we really focus on that individualized learning. And then we offer packages so you can save the more you commit to being a student." She is planning to become certified soon, and is currently looking at what certification body is the best for them. Any idea that pole fitness is just for strippers is dispelled at the studio. "Once people come in here, we have a really open environment that is co-ed and kid-friendly, and people sort of let that wash away really quickly," she said. One of her main markets, and one she said she finds most rewarding to help, is middle-aged women. "People who probably haven't done anything for themselves in the last 10 or 20 years because they've been raising their kids or focusing on their career, and now they're deciding to take some time for themselves," she said. "It's really nice to watch them grow and find that space and community." One of her customers is in her 70s, she said. They also book a lot of birthday parties for both kids and adults, pre-wedding parties and staff get-togethers. "I always say there's no better ice-breaker you can do than something like this as a group," she said. "Circus is an ancient art," Robinson points out. "I don't think it's going anywhere." For her, there's nowhere to go but up — literally. "Higher ceilings would be able to open up newer opportunities for us to have different types of equipment," she said. She'd also like to do more performing — right now they hammock dance at the closing party for Pride P.E.I. every year. Many public buildings like convention centres and Confederation Centre have rigging points in their ceilings, she said. Aerial Warehouse students have participated in three different Maritime competitions and brought home six medals, Robinson said — she was a judge at a recent show in Moncton, N.B. "You judge based on your presentation skills and your performance skills and the technical skills," she explained. Dancers put together a routine to a full song, she said, and dance between two poles or on an aerial apparatus such as a hammock or ring. Students don't need a background in dance or gymnastics or even fitness, she said. "You have to be nothing but yourself, and open-minded." Instructor Sarah Roach likes the strengthening aspect of the aerial arts, and the creativity of the dance aspect "without being a dancer." "For me it's absolutely not about the sexiness — I think it's whatever you want or need it to be, it can be that. I like the sport aspect of it, I like to test my body."